Detail of what appear to be handprints melted into the bronze bars on the front gate of Resurrection Cemetery. 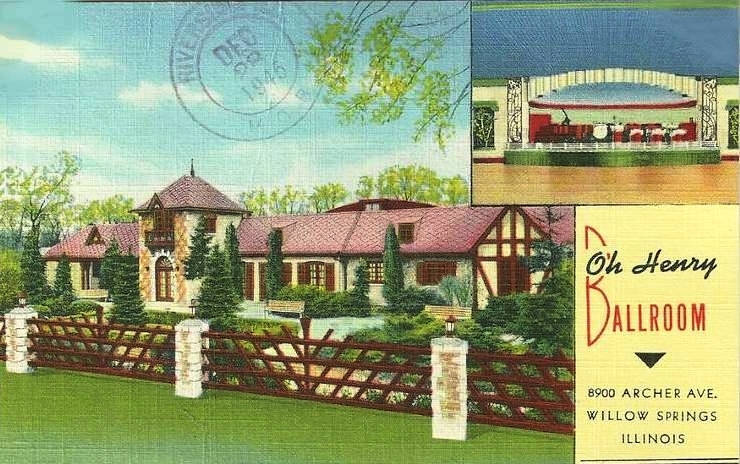 Postcard of the old Oh Henry Ballroom, postmarked December 28, 1945, before it became the Willowbrook Ballroom & Banquets. 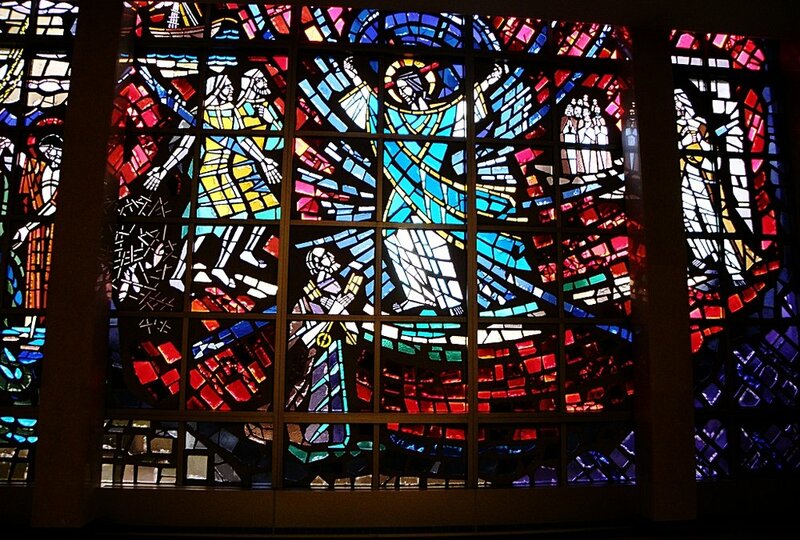 Detail of some of the stained glass at the main mausoleum at Resurrection Cemetery, Justice, IL, from the website, fantasyglass.net, where they list it as one of the "5 Best Stained Glass Pieces in the U.S."
Jerry Palus, who claimed that in 1939 he danced with a woman who called herself "Mary" at the Liberty Grove & Hall, at 47th and Mozart Streets. 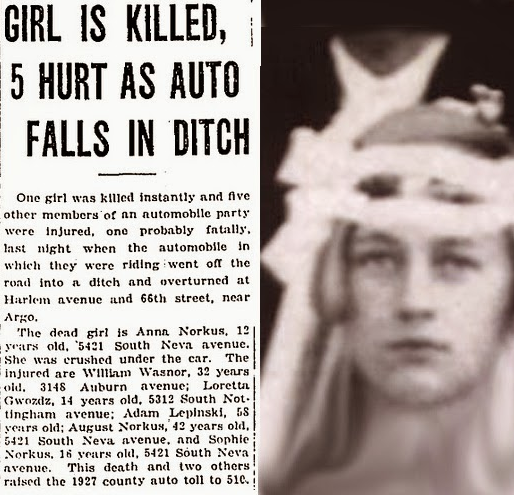 She vanished on the drive home while on Archer Avenue near Resurrection Cemetery. 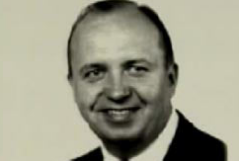 Mr. Palus' story is considered the most thorough account of meeting Mary. 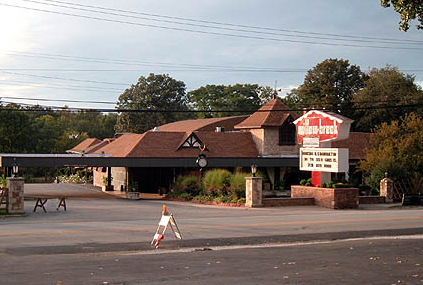 Chet's Melody Lounge, near Resurrection Cemetery. They've had a lot of interaction with Mary over the years. Actor Efren Ramirez, as his character "Pedro" from the cult classic film, Napoleon Dynamite. In his interview for this episode, author Adam Selzer said his vanishing Uber passenger looked just like him. 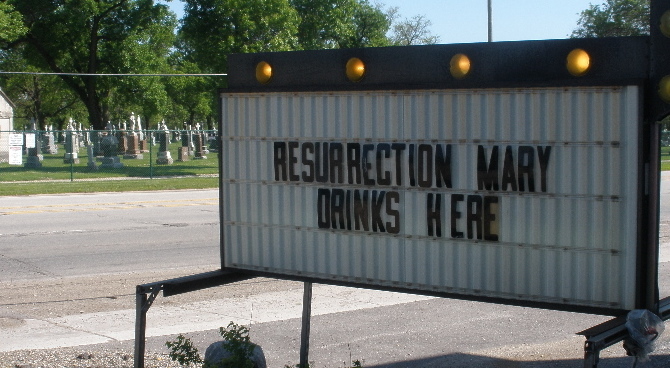 LOCATION: Resurrection Catholic Cemetery & Mausoleums, in the town of Justice, IL, southwest of Chicago, IL. 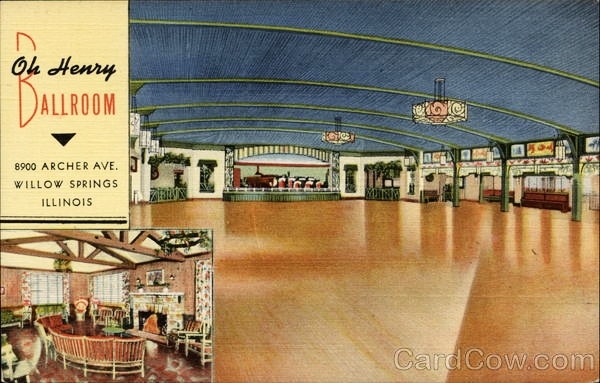 From the Willowbrook Ballroom (recently burned down) all the way along Archer Avenue leading to the cemetery is where most of the sightings of "Resurrection Mary" have occurred. If Resurrection Mary is just an Urban Legend, merely another variation of the "Vanishing Hitchhiker" then her story is a common one, with similar descriptions found in folklore all over the world. If she is a spirit, then she's also not alone, because it seems people of every country have come forward with testimony of meeting a real "Lady in White." If these ladies are a myth, or if they're real, or some combination of both, why are they so universally elemental? Why is she so primal? Do we see her because of the folklore, or is there folklore because we've seen her? But whether spirits or an archetypal legend, what these women are eternally searching for is something lost, like a child or a future taken away too soon. What they want is to return to a happier time when all was right with their world, to return home, wherever and whatever that home may be, so they may finally rest in peace. "Scan reveals 1,000-year-old mummified monk hidden in statue"
"The REAL Story Of The Batchelor’s Grove Cemetery Ghost, by a relative of the photographer"
"Birches residents get a Halloween scare on haunted bus tour"
Listen to our guest appearance on the Chasing Earhart podcast from our friends Chris and Vanessa Williamson! Come hear us ramble on about all things Amelia Earhart, including our favorite theories and the latest news & developments, like Dr. Richard Jantz's recent findings on bones found on the island of Nikumaroro! Click here for Part One and of course, we weren't done clogging Chris' hard drives to the brim, so here's a Part Two Bonus Conversation! Subscribe today! The Great Courses Plus – Learn about virtually anything, now with over 9000 lectures on almost any subject you can think of – from history and science to learning a new language, how to play an instrument or explore topics like food, the arts, travel, business, and self-improvement! And now their app lets you listen to just the audio from the courses or watch the videos, just like a podcast! Available for iOS and Android. So head on over to TheGreatCoursesPlus.com/LEGENDS to start your special, limited time only, FREE ONE MONTH TRIAL with unlimited access today! Dumb People Town – Forget your troubles for a while by having a laugh at criminals doing dumb things! Dumb People Town is a weekly podcast is hosted by comedy duo Jason and Randy Sklar along with comedian Daniel Van Kirk, where they take a look at real news stories from around the world about people doing the dumbest things you can imagine in trying to get away with stuff; and a lot of things you can't imagine! You just won't believe some of the stories you hear! Subscribe to Dumb People Town on iTunes, Spotify, TuneIn, Stitcher, or wherever you listen to podcasts. Click on https://starburns.audio/podcasts/dumb-people-town/ for more information. Episode 105: Resurrection Mary Part 4. Produced by Scott Philbrook & Forrest Burgess; Audio Editing by Sarah Vorhees Wendel; Ryan McCullough Sound Design; Research Assistance by Tess Pfeifle and the astonishing League of Astonishing Researchers, a.k.a. The Astonishing Research Corps, or "A.R.C." for short. Copyright 2018 Astonishing Legends Productions, LLC. All Rights Reserved. How many reported sightings of a particular ghost would it take before you started to believe that perhaps people were indeed interacting with something supernatural? Hundreds? Over a thousand? But you're looking for proof, you say. Well, what would be convincing proof for you? What about mysterious, spectral handprints melted and scorched into bronze bars that have resisted repair and coverup? Tonight in Part Three of our series, we examine the possibility that Mary may have left her indelible mark not only on the front gates of Resurrection Cemetery but also in the imaginations of Chicagoans ever since. In addition to a respectable oeuvre of books on fascinating historical and ghostly topics, our interview guest Adam Selzer has a terrific new podcast all about strange and forgotten tales of history, true crime and so much more on the way! Go to his website: cemeterymixtape.com to listen and subscribe today! If you want to hear a great (and much more concise) take on the legend of Resurrection Mary, plus a large assortment of spooky tales about haunted places, creepy history, and forgotten folklore, all told in a narrative style by a real Ghost Tourguide, then you need to check out Mike Brown's Pleasing Terrors podcast! Every two weeks, Mike will walk you through the dark shadows of reality and shine a light on the ghosts in the theater of your mind. Go to Apple Podcasts or wherever you find outstanding shows and search for Pleasing Terrors, or click on, or copy n' paste this link into your web browser's locator: https://itunes.apple.com/us/podcast/pleasing-terrors/id1141063625?mt=2 Your imagination will never be the same! Blue Apron – Get professional chef-designed recipes delivered right to your door that are fun to make, and even more fun to eat! These meals are restaurant quality, using fresh, inventive ingredients with simple step-by-step instructions that arrive with the flexibility your hectic schedule requires, and the flavor your taste buds demand! And now, Astonishing Legends listeners can check out this week's menu and get $30 OFF your first order by going to BlueApron.com/astonishing. The Confessionals Podcast – Listen to discussions with some of the most interesting authors and researchers in the fields of the Paranormal, UFOlogy, Cryptozoology, Conspiracies and more! The Confessionals is a true-story based podcast where every Saturday night, host Tony Merkel interviews people about their projects or experiences with the strange and unexplained. There are over 60 shows to binge on and guests have included L.A. Marzulli and Gary Wayne, Jim Wilhelmsen and John Edwards, owner and "alien slayer" of the Stardust Ranch in Arizona! Look for The Confessionals on iTunes, Stitcher, Google Play, Alexa, and many other podcast players. Or, go to their website: TheConfessionalsPodcast.com. You can also support the show by going to Patreon.com/TheConfessionals and Patrons can listen to live interviews before they air and get access to live call-in shows, where they can connect with Tony the host and other special guests! Episode 104: Resurrection Mary Part 3. Produced by Scott Philbrook & Forrest Burgess; Audio Editing by Sarah Vorhees Wendel; Ryan McCullough Sound Design; Research Assistance by Tess Pfeifle and the astonishing League of Astonishing Researchers, a.k.a. The Astonishing Research Corps, or "A.R.C." for short. Copyright 2018 Astonishing Legends Productions, LLC. All Rights Reserved. Detail of some of the stained glass at the main mausoleum at Resurrection Cemetery, Justice, IL, from the website, fantasyglass.net, where they list it as one of the "5 Best Stained Glass Pieces in the U.S." From the website's listing: "Resurrection Cemetery is home to the largest stained glass window in the world. It is over 22,000 square feet and contains over 2,000 panels. It was created by Pickel Studio. At night the cemetery sometimes backlights the mausoleum and it looks stunning." – Mark Rudnicki, eyewitness to "Resurrection Mary" from an exclusive interview in tonight’s episode. As you delve into the legend of "Resurrection Mary," you'll soon notice that the stretch of Archer Avenue from Resurrection Cemetery to the Willowbrook Ballroom is not the only piece of land that seems haunted, nor is it haunted just by "Mary." It seems the entire locality has a supernatural quality to it, enough that Chicago's "Southwest Siders" have dubbed it "The Archer Triangle," in reference to the more famous one near Bermuda. But what is it about this region that spurs so many reports of paranormal activity? Is it the legacy of ancient Native American activity, the numerous cemeteries located here, or Ley lines and waterways? Is it all an imagined coincidence or is there a more sinister force at play? Tonight, we take a more thorough look at Mary's favorite haunts and examine why the spirits of the area appear to be so restless. The Great Courses Plus – Learn about virtually anything, now with over 9000 lectures on almost any subject you can think of – from history and science to learning a new language, how to play an instrument or explore topics like food, the arts, travel, business, and self-improvement! And now their app lets you listen to the courses as well as watch, just like a podcast! Available for iOS and Android. So head on over to TheGreatCoursesPlus.com/LEGENDS to start your special, limited time only, FREE ONE MONTH TRIAL today! Conspiracy Theories – Would you like to know more about your favorite conspiracies, like the Death of Princess Diana, The Illuminati, Chemtrails, and Area 51? So would we! That's why we suggest checking out a new podcast from the Parcast Network called, Conspiracy Theories. Every Wednesday, the hosts of Conspiracy Theories explain to you the intricate and complicated stories behind the world’s most controversial events and possible cover-ups. With thorough investigation from their team of researchers, the hosts expose the possible secrets behind the "Official Version" of these stories and tell you what they believe is the real truth. Because as they say, the truth isn’t always the best story… and the official story isn’t always the truth! So Visit Apple Podcasts, TuneIn, Spotify, GooglePlay, or wherever you listen to podcasts and search for "Conspiracy Theories." Or visit Parcast.com/CONSPIRACY to start listening now! Episode 103: Resurrection Mary Part 2. Produced by Scott Philbrook & Forrest Burgess; Audio Editing by Sarah Vorhees Wendel; Ryan McCullough Sound Design; Research Assistance by Tess Pfeifle and the astonishing League of Astonishing Researchers, a.k.a. The Astonishing Research Corps, or "A.R.C." for short. Copyright 2018 Astonishing Legends Productions, LLC. All Rights Reserved. Composite image of "Resurrection Mary" by Skye D. on flickr, used under Creative Commons license: Attribution-NoDerivs 2.0 Generic (CC BY-ND 2.0) No changes were made. "Just take me up Archer." – A ghostly passenger fitting the description of "Resurrection Mary," who had been offered a ride by a man known only as "Tony" on September 5th, 1980. She soon vanished from his car. 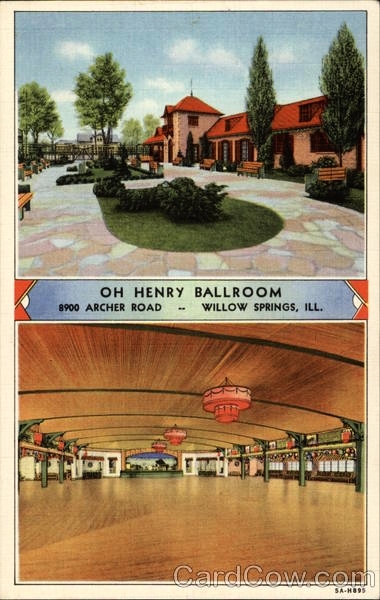 Legend has it, that sometime in the late 1920s or early '30s, a young couple was enjoying an evening of dancing at the Oh Henry Ballroom, later renamed the Willowbrook Ballroom & Banquets, located southwest of Chicago, IL. After an argument, the woman stormed out, deciding she'd rather walk home than spend another minute with her boyfriend. As she walked along Archer Avenue on a wintery night, she was struck and killed by a hit and run driver. Her bereaved parents buried her at nearby Resurrection Cemetery in the white ballgown and shoes in which she died. Ever since, people have reported either dancing with or giving a ride to a hauntingly beautiful young woman, with long blonde hair and blue eyes, dressed in a white gown, who at some point vanishes from their midst. Accounts of these spectral encounters have been so numerous over the years that the legend of "Resurrection Mary" is perhaps Chicago's most famous and beloved ghost story. The Great Courses Plus – Learn about virtually anything, now with over 9000 lectures on almost any subject you can think of – from history and science to learning a new language, how to play an instrument or explore topics like food, travel, business, and self-improvement! And now their app lets you listen to the courses as well as watch, just like a podcast! Available for iOS and Android. So head on over to TheGreatCoursesPlus.com/LEGENDS to start your special, limited time only, FREE ONE MONTH TRIAL today! Casper – You'll spend about one-third of your life sleeping, so why not get the most comfortable mattress you can buy, and at a reasonable price? Casper mattresses are cleverly engineered to mimic human curves, cradling your natural geometry in all the right places, thereby providing supportive comfort no matter your body type! Casper now offers two other mattress models, the Wave and the Essential, as well as a wide array of other products like pillows and sheets, all designed to ensure an overall better sleep experience. YOU can enjoy this same level of comfort, wake up refreshed and be sure of your purchase of a Casper mattress with their 100 night, RISK-FREE, Sleep On It Trial! Just go to casper.com/AL and use Promo Code "AL" at checkout to get $50 towards a Select Mattress purchase! This offer is only applicable towards Select Mattresses and Terms and Conditions apply. SQUARESPACE – Whether you're thinking of creating a website to present your ideas or endeavor, or it's time to refresh that old, tired-looking one you have from 15 years ago, you need it to be impressive and capture people's attention, and you don't need someone else to make it for you. You can easily do it all yourself with Squarespace! Check out Squarespace.com for a FREE TRIAL and when you’re ready to launch, use the Offer Code "LEGENDS" to save 10% OFF your first purchase of a website or domain. Whatever you make, make it beautiful, make it stand out, and make it yourself, with Squarespace. Episode 102: Resurrection Mary Part 1. Produced by Scott Philbrook & Forrest Burgess; Audio Editing by Sarah Vorhees Wendel; Ryan McCullough Sound Design; Research Assistance by Tess Pfeifle and the astonishing League of Astonishing Researchers, a.k.a. The Astonishing Research Corps, or "A.R.C." for short. Copyright 2018 Astonishing Legends Productions, LLC. All Rights Reserved.